A medical agency was organising a series of events across Europe for thousands of delegates signing in to different sessions. The client needed a record of each session each delegate had attended so they could be awarded CPD credits. The client realised that managing this through a manual system of ticking names off a list would simply be a logistical nightmare. Imagine their reaction then when they were presented with our Interactive Delegate Management system (IDM) enabling delegates to be registered quickly, efficiently and without the need for a tedious paper trail. 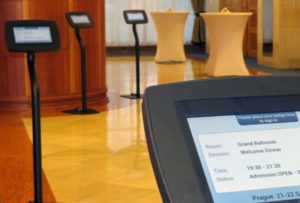 At each session, Smart tablet kiosks were placed outside the main room. 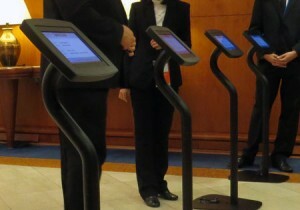 Equipped with customised Smart badges, delegates swiped their badge on the kiosk reader to record their attendance. Once swiped, the delegate’s name appeared on the screen and he/she was greeted with a welcome message. Each person then simply walked into the session. With registration in flow, agency staff were immediately impressed by the benefits IDM brought; delegates were able to register themselves quickly, long queues of waiting delegates were removed and staff avoided ticking names off a list or scanning barcodes manually. Our system made organisers lives easier; they could rely on it to manage the attendance process effectively letting them focus on other logistics. 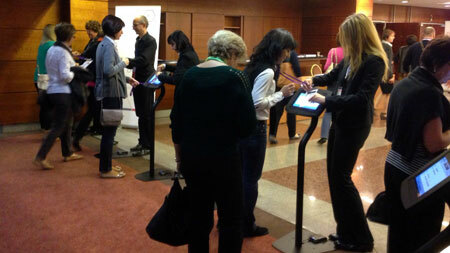 The clear record of delegates’ attendance also saved them time as reports were available at the touch of a button. The client has been so impressed with how the technology has worked that they are now going to use the IDM system for all their future conferences. Thank you and your team for an outstanding performance. I was thrilled by your batch reader (we’ll never ever cross out missed attendance on certificates again). I couldn't have asked for a better team and will always ask for this team again. Contact us now to see how we can make delegate management easier at your event!